Our private dining room has been specially designed to accommodate the needs for a smaller group wishing to have a modest and a more private meeting, presentation or function. 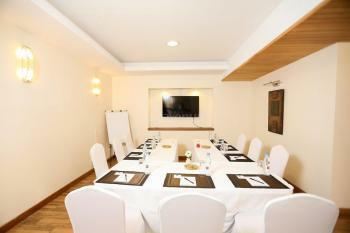 This room is fitted with a large screen TV for presentation purposes. Located within Ventana Restaurant on the ground floor, the private dining room has easy access to the restaurant and a more personalized service. It is ideal for a group of 5 to 20 people. There are no reviews for Bidwood Suites Hotel Private Meeting Room yet. Sorry, not available at Bidwood Suites Hotel Private Meeting Room. Kindly check out other available dates or check out other venues in Westlands that match your requirements.